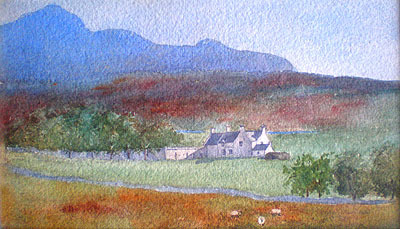 Janet Macdonald (Jennie) of Mudale, Sutherland married John George Bartholomew on 23 April 1889 in Edinburgh, Scotland. All John George's descendents are hence also descended from this northern branch of the Macdonald family. As a result of that marriage, a close family bond has been sealed between the Bartholomew and Macdonald families to this day, especially with the Macdonald lines now living in the United States. John George's descendents associate themselves closely to the Macdonald clan traditions and have adopted the Macdonald tartan with pride. For the genealogy of the Macdonalds of Sutherland Genealogy, click here. 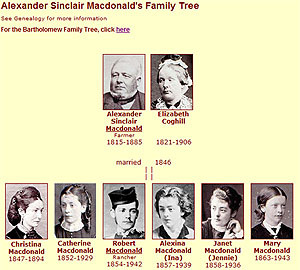 Click on the image to the left for a view of the the Macdonald family with Jennie Macdonald's parents and her siblings. The family spread out with two lines going to the United States and two remaining in the United Kingdom.